Today we are actually focusing on 3 features that we put in our own home when we renovated our kitchen. While there was little to no additional cost in adding them, they added so much value for us and we love them. A deep and wide sink: While some people choose a double sink in their kitchen, we are big fans of our deep and wide sink shown below. It’s great for washing big pots, cleaning big bowls of greens and looks great too. We highly recommend considering one. 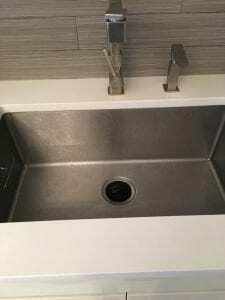 A faucet with a pullout spray attachment: Great for easy clean up or filling a large pot, I would not want to be without this feature. It can also be seen in the photo below. Bookshelves in the island: A neat and easy way to keep your cookbooks readily available in the kitchen. These are actually 3 of our favorite kitchen features. If you decide to try them, we’d love to know how they worked out for you.